Most of our research investigates the interlinked history of greenhouse gases and climate, and related topics like ice core dating, method development, and various other things. Holocene carbon dioxide and nitrous oxide dynamics from the South Pole Ice Core (SPICE). We are using carbon, nitrogen, and oxygen isotopes to try to understand why these two gases change during the last 10,000 years and to constrain the role of early human activities on their abundance. This follows earlier late Holocene CO2work on the WAIS Divide ice core (Bauska et al., 2014). Atmospheric records from the Taylor Glacier ablation zone. 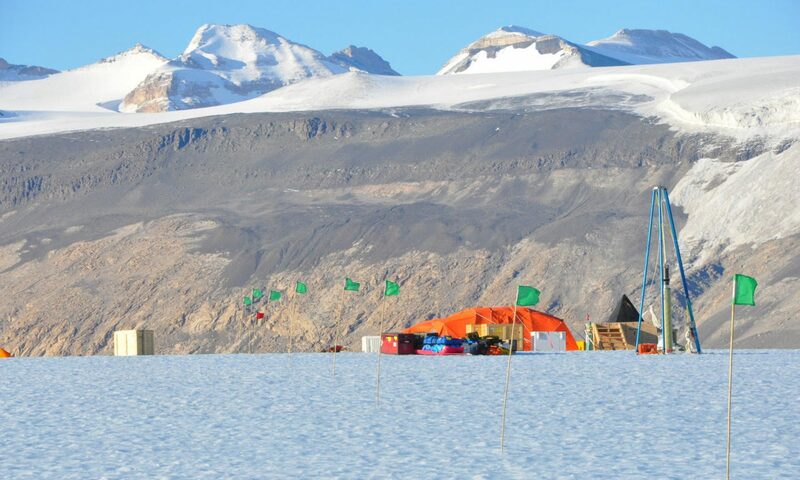 With collaborators at University of Rochester and Scripps Institution of Oceanography we are mapping ancient ice outcrops on Taylor Glacier in Antarctica, and using large samples taken from the glacier near surface for high precision measurements of gases and their isotopic composition. Recent work reconstructs the δ13C of atmospheric CO2 (Bauska et al., 2016) and the isotopic composition of N2O (Schilt et al., 2014) during the last deglaciation. We are now during our attention to older time periods in this record. Greenhouse gas dynamics during the last ice age from the WAIS Divide Ice Core. We are using the very high resolution WAIS Divide ice core to investigate the fine details of abrupt changes in atmospheric CO2 (Marcott et al., 2014) and CH4 (Rhodes et al., 2015). New work using stable isotopes in CH4 and CO2, and the interpolar gradient in CH4, will take this work further. Ice core chronology and the bi-polar see saw. 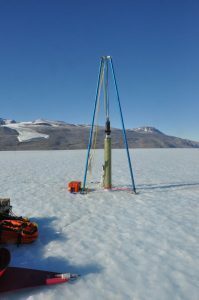 Gas records, particularly methane concentration records, provide a way to synchronize ice core records and precisely compare climate data from different locations. Applications include detailed constraints on the timing of the bipolar see saw (WAIS Community, 2015) and dating the new RICE ice core from Roosevelt Island in Antarctica. Continuous gas measurements in ice cores. We are using laser spectroscopy and continuous melter systems to measure gases continuously (Rhodes et al., 2013; 2015), with applications in the above work and in detailed studies of trace gas anomalies in ice cores (Rhodes et al., 2016; 2017). We now deploy these systems in the field for rapid analysis and stratigraphic mapping on ablation zones. Future work could develop isotopic analysis and other aspects of gas records. Studies of 1 Ma old ice from Alan Hills, Antarctica. In a project led by colleagues from Princeton and University of Maine we are making the oldest direct greenhouse gas measurements known, in isolated pockets of 1 Ma ice in Antarctica (Higgins et al, 2015). New ice samples will provide more, and older material for this work. Stable isotope research. We developed high precision carbon isotope measurements for atmospheric CO2 in ice (Bauska et al., 2014), isotopic measurements of N2O (Schilt et al., 2014) and are now starting to develop methane isotopic measurements and site specific isotope measurements in N2O. Expanding the scope of these measurements to the penultimate interglacial and older time periods is a major goal. Other work: We continue exploring the mysteries of total air content in ice cores, and occasionally work on extraterrestrial dust in ice (Brook et al., 2009) and cosmogenic isotopes in rocks.